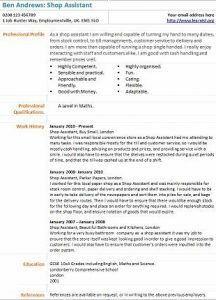 Shop Assistant CV example and template. Amend as suitable and create your own CV template in seconds. Your job is very similar to Sales Assistant’s one. Shop Assistants job vacancies can be found on the job sites online including totaljobs, reed and cv-library.co.uk. Visit those job boards and start searching current vacancies. Shop Assistant job application letter. Shop Assistant job application letter example. As a shop assistant I am willing and capable of turning my hand to many duties, from stock control, to till managements, customer service to delivery and orders. I am more than capable of running a shop single handed. I really enjoy interacting with staff and customers alike. I am good with cash handling and remember prices well. Working for this small local convenience store as a Shop Assistant had me attending to many tasks. I was responsible mostly for the till and customer service, so I would be mostly cash handling, advising on products and prices, and providing service with a smile. I would also have to ensure that the shelves were restocked during quiet periods of time, and that the till was cashed up at the end of a shift. Shop Assistant, Parker Papers, London. I worked for this local paper shop as a Shop Assistant and was mainly responsible for stock room control, paper delivery and ordering and shelf stacking. I would have to be in early to take delivery of the newspapers and sort them into piles for sale, and bags for the delivery routes. Then I would have to ensure that there would be enough stock for the following day and place an order for anything required. I would replenish stocks on the shop floor, and ensure rotation of goods that would expire. Working for a very busy bathroom company as a shop assistant it was my job to ensure that the store itself was kept looking good in order to give a good impression to customers. I would also have to ensure that customer’s orders were inputted into the order system.